The forced assimilation of Kurdish citizens in Turkey came to an end during the Justice and Development Party's (AK Party) rule in the last decade, President Recep Tayyip Erdoğan said yesterday in the southeastern province of Van, which has a large Kurdish population. "We have ended the assimilation. Kurds in this country aren't being discriminated against for being Kurds anymore. 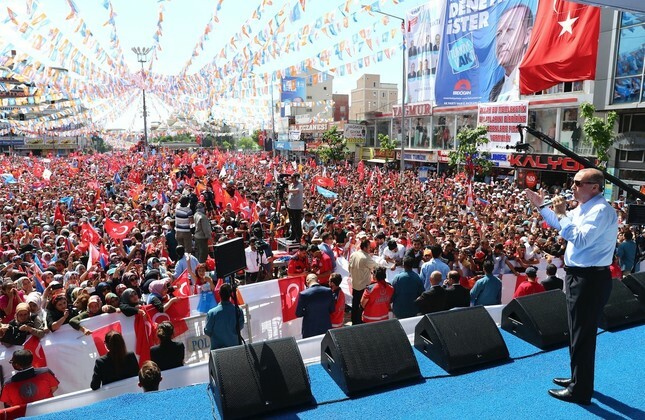 We refuse to support this kind of negative pressure," said Erdoğan during his rally in the province, while adding those who continue to discriminate will have to deal with Erdoğan himself first. "In this country, all of our 81 million citizens have the same rights and freedoms, and receive the same services," the president added. Mentioning the AK Party government's years of fighting against the terrorists in the region, the president said the country has fought various groups' repeated efforts to destabilize the region, calling people to stand against terrorism through their democratic right to vote on June 24. "What have the wings of terrorist organizations done for you?" president further asked, referring to the municipality mayors removed for alleged links to terrorist activities. "What they have done with the money that they should have used to serve you? They sent it to Qandil [the headquarters of the PKK]," he continued. In 12 different regions across several provinces, including Van, Şırnak, Mardin, Batman, Hakkari, Muş and Diyarbakır, pro-PKK locals allegedly claimed self-rule in the 2015. Following the claims, the mayors of the provinces were arrested and replaced with new trustees. In 2016, a Turkish court sentenced 17 people, including a co-mayor of Van, to seven to 15 years in prison on charges of being a member of the PKK terrorist organization. A supporter of the Peoples' Democratic Party (HDP), Bekir Kaya, 38, had already served time in jail from 2012-2013 for the PKK's role in Van. "Van is ours. We were here when there was an earthquake. We have raised the province from the ashes. We spent TL 16 billion [$3.37 billion] for earthquake recovery expenses alone," the president said, underlining that the AK Party bases its policies on services, while the PKK bases its policies on bloodshed. In 2011, Van was shaken by a 7.2-magnitude earthquake that killed 604 people. The 25-second earthquake razed buildings. Luckily, casualties were relatively low since it occurred around noon, but it left the city in ruins and Van was a shadow of its former self in the aftermath with over 36,000 buildings heavily damaged. "They destroy. We build," he added, while urging the youth to ask their parents what Van was like in the past. Touching on the tourism opportunities of the province, Erdoğan said they will do their best to attract tourism investors to Van. "Van does not have the resources to support the demands of Iranian tourists right now," president said, referring to the increasing Iranian tourist flow to the province. "With the newly built hotels, we will host Iranian tourists. We will do our best on the matter regarding encouragement and funds," he added, while highlighting that there is only one condition that would draw investors to the province: Peace. "[That is why] we refuse to be scared of the terrorism and terrorists," the president underlined.